Innovation meets the outdoors with pit boss' all new digital electric vertical wood smokers. Never before has smoking been this versatile. The large front window eliminates the need for peek-a-boo cooking & the elevated frame makes transferring your meal from the smoker to the table a breeze. 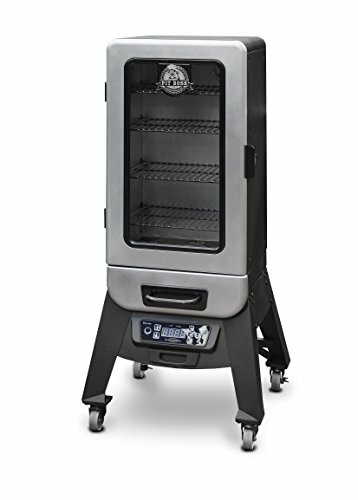 The vertical smokers feature porcelain coated cooking racks, a front access grease drawer, wheels, & a high temperature door seal. The digital controls ensures even & consistent cooking temperatures while the integrated meat probe allows you visibility of smoking progress. The multiple position racking system ensures you'll have enough room to smoke anything your heart (or stomach) desires. If you have any questions about this product by Pit Boss Grills, contact us by completing and submitting the form below. If you are looking for a specif part number, please include it with your message.